No matter how hard you try, you simply can’t avoid all toxins. Your kids are going to be exposed to toxins on a daily basis. There are too many chemicals lurking in food, water, air, schools, playgrounds – and especially all the stuff in your home. Everyone living in this world has some level of toxicity in their body, and it’s important to keep this at a minimum. What you want to avoid is toxic overload. This is when the toxins accumulate without being eliminated properly. You want to avoid getting to the tipping point when symptoms begin happening and chronic illness develops. Toxic overload is known to be a primary root cause of the current epidemics of autism, ADHD, asthma, allergies and other chronic health issues. Consider the exposures over which you have some control. This includes the products that you buy for your home, such as toys, furniture, mattresses, bedding, cookware, and cleaning products. It also includes body care products like lotions, shampoo, etc. You can use an air purifier to reduce the toxins circulating in the air and residing in the dust in your home. And a water purifier for clean pure water. One of the most important things you can do to reduce toxic exposure is to buy organic whole foods instead of processed conventional GMO foods. Be cautious about doing intense detoxing with your kids. Extensive detoxing with supplements or chelation may be necessary if your child has a chronic illness, but this should only be done under the supervision of a qualified health practitioner. Many people think that detoxing means removing or eliminating, so they go on cleanses or fasts to remove waste from the body. But detoxing is complex and requires specific nutritional support. Extreme fasting and cleansing can be counterproductive and even dangerous in a body that is undernourished. People can get much worse if they do not have the nutrients needed to detox. 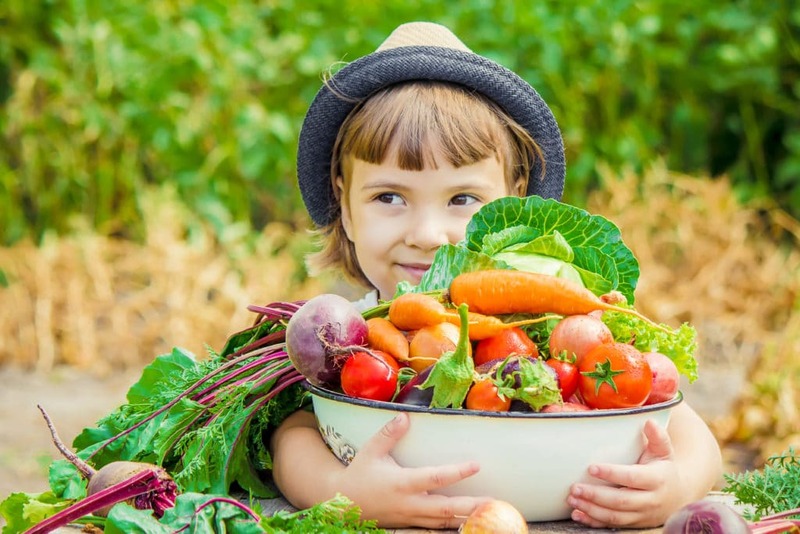 The safest and most effective way to reduce the toxic load is to make changes to the diet to optimize your child’s normal ability to regularly remove toxins. The main organs involved in detoxing are the liver, kidneys, large intestine, lymphatic system, and sweat glands (skin). The body is always working to neutralize and break down the toxins so they can be moved out of the body. This sounds simple, but detoxing is a very complex process that is completely dependent on adequate nutrients, including enzymes, vitamins, minerals, amino acids, antioxidants, and other compounds. Gut dysbiosis is an imbalance in the bacteria and other flora in the gastrointestinal tract. This is very common in kids and can be caused by antibiotics, environmental toxins, stress, poor diet, C-section birth, and other issues. If your child’s gut flora is not optimal, their ability to detox is compromised. It’s common for kids to have genetic mutations called polymorphisms or SNPs that compromise the body’s ability to detox. You can have your child tested, and a nutritional program can be prescribed to normalize the detox process. As I mentioned, detoxing requires sufficient nutrients. Some kids have specific deficiencies that may need to be addressed with supplementation. You can do lab testing for nutrient levels and work with a knowledgeable health professional to balance your child’s unique nutritional needs. There can also be nutrient overloads and the wrong supplements may make existing issues worse or can create new problems. A cumulative effect of multiple toxic insults can overwhelm the body. Some kids have ongoing exposures giving them a bigger body burden than their system can handle. Mental and emotional stress affects every system in the body, including detoxing. In order to detox efficiently, your child’s stress levels need to be kept at a minimum. The safe way to optimize detoxification is with food – specifically unprocessed, organic plant-based foods. In order to get the nutrients needed for detox, kids need to eat plenty of organic plant foods that are nutrient dense and high in fiber. Eating these foods will support the liver and other detox pathways. It will also allow the gut flora to be healthier and more balanced and increase the function of every system of the body. Kids need a variety of colorful fruits and veggies that contain phytonutrients to support detoxing. Phytonutrients are key to detoxing because they positively affect the liver and other organs and they reduce inflammation and oxidative stress. It’s good to eat a variety of different colored fruits and vegetables every day. The servings do not have to be large. Small amounts of different colored fruits and vegetables will add up to a wealth of phytonutrients that will make a huge difference. A fun game for kids is to try to eat all the colors of a rainbow in a day. Let them choose their fruits and vegetables so that they can say at the end of the day they “ate a rainbow”. NOTE: for a comprehensive guide to phytonutrients and a food list for each color with ideas and tips on how to incorporate them into the diet, enter your email below. These are included in my ebook Healthy Foods for Kids – How to Choose the Most Beneficial Food and Encourage your Kids to Love It! Particularly important vegetables for detoxing are those containing sulfur. These include garlic, broccoli and other cruciferous vegetables. Add in these foods in as much as you can. Fermented vegetables are also great for balancing the gut flora. Chlorella, cilantro, parsley, beets, ginger, and turmeric are powerful detoxing foods. Hint – you can add some of them to smoothies. Protein is also essential for detoxification. The body cannot effectively detoxify without amino acids (building blocks of protein) to bind the converted toxins in the liver so they can be carried out of the body. Protein also stabilizes blood sugar. It’s ideal to include some protein in every meal for ongoing support of detox. Good sources of protein are pastured eggs, wild fish, grassfed meat, and pastured poultry. The quality of animal protein is vital and should always be organic, grassfed, wild, or pastured. Vegetarian sources are miso, natto, tempeh, and hemp or pea protein powders. Beans are a good way to get protein and fiber. Raw, organic nuts and seeds are also great for snacking and added to meals. Avoid fish with high mercury content. This includes bluefish, grouper, mackerel, marlin, orange roughy, sea bass, shark, swordfish, tilefish, and tuna (canned albacore, yellowfin, bigeye, ahi). Shellfish is often contaminated with mercury and other toxins. Farmed fish may contain hormones, PCBs and other toxic chemicals. Cold-pressed, organic, non-GMO fats are also important. Fats and oils from avocados, coconut, flaxseed, olives, rice bran, and sesame seeds are essential for detoxification. It’s very important for kids to have healthy elimination so it’s necessary to keep the bowels moving. They need one to two healthy bowel movements a day. This means they need to eat plenty of fiber and drink plenty of filtered water. Toxins are removed through pooping, peeing and sweating so make sure this is all happening regularly! The second step in the optimal diet is to remove toxic foods and food triggers. Organic food is vital to reduce exposure to pesticides, herbicides, and GMOs. Buy foods in season and from local organic farmers. Or better yet, grow your own food. You can also buy clean organic food at low prices online at Thrive Market. Avoid foods that contain preservatives, food colorings, and artificial sweeteners. Avoid food that comes in cans, plastic containers, or cardboard. Instead buy whole foods with minimal packaging. Use glass, ceramic, or stainless-steel containers for heating and storing hot food. Avoid plastic bottles. Filter your drinking and cooking water with a good water purifier. Cook with non-toxic pots and pans that aren’t worn or scuffed to minimize release of toxic compounds while cooking. Sugar is a toxic food since it can stress the body systems and create inflammation, making it more difficult for the body to effectively clear toxins. Read about healthy sugar alternatives for kids. It’s important to identify any foods that might be causing adverse food reactions in your kids. Removing these foods will reduce inflammation and help the gut to get back in balance, which will support the detox pathways. This is especially important if your child has a chronic illness. Wheat, dairy and sugar are the biggest culprits in inflammation so it’s important to reduce or remove these foods. There are many other foods that can cause reactions in kids. For details on elimination diets for kids see the section on Food Reactions and Sensitivities in this article. NOTE: Don’t make any drastic changes to your child’s diet without consulting a nutritionist or a doctor who knows about nutrition. Epsom salt is magnesium sulfate, a compound comprised of two minerals – magnesium and sulfur. Both of these minerals are essential in helping to flush toxins from the body. Epsom salt baths can be a safe way to increase levels of both magnesium and sulfate since they can be absorbed through the skin. Dissolve two cups of Epsom Salts in a standard size bath with warm (not too hot) water. Soak 2-3 times a week for at least 15 minutes and up to 20-30 minutes. Don’t use soap in the bath and, rather than rinsing off, let the Epsom salt dry and stay on the skin for maximum absorption. Toxins are released through the skin through sweating. Regular exercise is important. It’s great to let kids work up a sweat with exercise. Jumping on a trampoline or rebounder is a great way to stimulate the lymphatic system to remove toxins. It’s safe for kids over age six to use infrared saunas for up to 20 minutes. One of the benefits of a quality infrared sauna is that it produces a lower temperature than the conventional type of sauna and the surfaces don’t get hot enough to cause contact burn. But make sure you watch your kids during and after the session to see how they react to the heat. In addition to detoxing, a sauna can be nurturing and calm the nervous system. A good time for kids to take a sauna is before an evening bath or shower. It can get them relaxed for bedtime. Bouncing on a mini-trampoline or rebounder right before a sauna can open up the skin pores and stimulate lymph flow. Drink water before and during a sauna. Coconut water is a good electrolyte replacement drink. Don’t allow the sweat (toxins) to reabsorb into the skin. Take a shower immediately after a sauna. Use a sauna with zero EMFs. Saunas are not recommended for babies or very young children. At Healthy Child we recommend the SaunaSpace, a near infrared incandescent lamp sauna. The SaunaSpace incandescent light source produces full spectrum light emission and detoxifies most effectively and efficiently. It is also the safest, zero EMF sauna that has no off-gassing or VOC emissions. It’s portable, versatile and storable and has a 100-day risk-free trial. No mention of the toxic load of childhood vaccines…..